The settlement, first called Troy, began rapidly growing after 1852 when Belleville merchant Billa Flint purchased land along the Skootamatta River for his saw mill. Over the years Flint opened flour, oat and barley mills as well. The renamed town of Bridgewater thrived, complete with a foundry, cabinet and chair manufactory, a scythe and edge tool factory, a tannery, a woolen mill, various tradesmen and a school and church made from local marble. In the 1860’s Flint constructed the Temperance Hotel, the largest in Hastings County. After a disastrous fire in 1889 that consumed the greater part of the village, Bridgewater never recovered. In 1885 Joseph James had purchased much of Flint’s land, and began open-pit mines to extract actinolite. The mineral was used in fire-proof insulation and in a roofing compound. 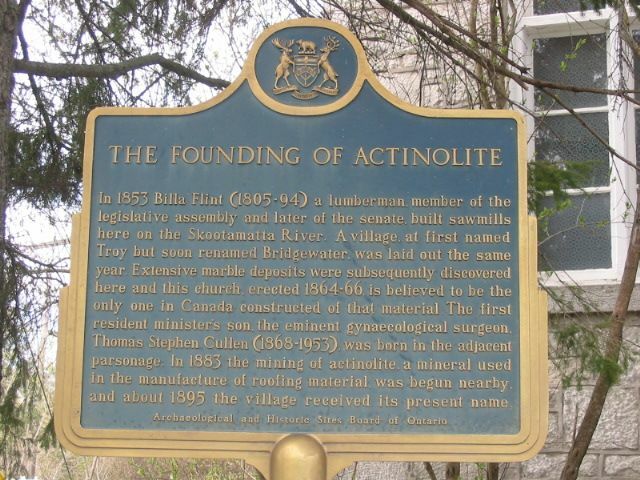 In 1895 Mr. James convinced officials in Ottawa to change the name of the village to Actinolite. The Bay of Quinte Railway was extended from Tweed through Actinolite in 1903, followed by Highway 7 in 1932 and Actinolite turned into a tourist destination. Actinolite is a close-knit community that has historically always come together in tough times. The Marble Church Arts Centre (and theatre) that still stands in the community today is an excellent example of this. Built in 1864 when the town pooled financial resources, it was badly damaged in the fire of 1889. With only the white marble walls still standing, the community once again came together to quickly rebuild it. It is still maintained today, and is the center of community life with musicals, concerts and work shops year around. Actinolite is also home to the Bridgewater Retreat, a place full of natural beauty and fantastic scenery with the rock formations, mixed forests, Skootamatta rapids, natural sand beach, plenty of wildlife and historical log cabins for a relaxing getaway. The Skootamatta River, which runs through Actinolite, is considered with Skootamatta Lake to be one of the clearest bodies of water in Ontario and a well-known paddling route. If adventure is your definition of fun, Actinolite has a very active geocaching community. 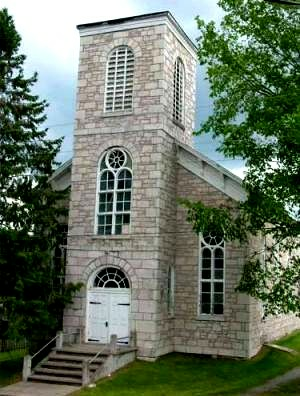 Actinolite is also home to a Country Jamboree on the 1st Sunday of every month at the Actinolite Hall (pictured below).